I think MJ should just start his next RR in the Role of Honour section. Then all this moving business is not needed. Seriously though. I love to read his reports. MJ hierdie een het ek ook nou eers raak gelees. Ek wil jou net komplimenteer op jou skryf styl. Dit is fantasties. Hou so aan. ditto; an old favorite, you better show us a photo of kid again, on the back of your bike, she must be ready to ride her own bike; … planning a trip on bikes there in 2013, this rr was first inspiration, followed by others…. Awesome stuff, Many of us have been on these roads but having a kid on the back.. man, that is just great stuff. I've read this report on advrider and absolutely loved it. 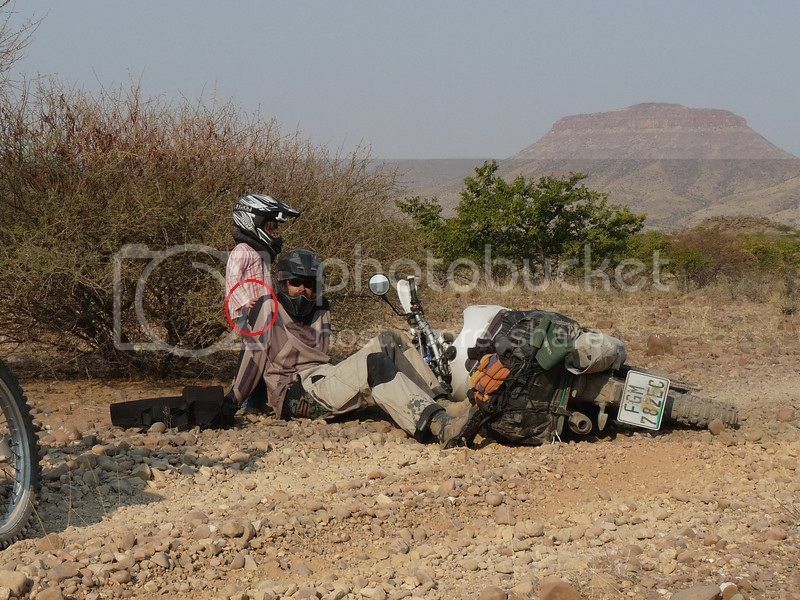 I'd love to ride Namibia before I am too old to do it. A friend of mine got killed by an elephant in Kenya, the night before he was due to leave for home. Seeing these animals with nothing between me and them would scare the hell out of me. Thanks for a great report, it's inspiring. Wow, what more can I say, loved every word, and I hate reading, but I love reading this RR. I feel like I know you guys personally. (Almost) three years later and the compliments will keep on coming. Spectacular ride report sir! Apart from one snapped chain, everything just seemed to go perfectly! Thank you for posting such a comprehensive report, and thank you for the inspiration you have provided me and numerous others! The RR had me glued to the screen. We are planning to go to the area where you guys were at Bots, i have so many new places to go to now thanks to you. And another thing. Your family rocks man. I bow down to your wife and kid, they are legendary stuff. Just read your amazing RR again. Absolutely an once off trip in a lifetime - Nothing you do in future, can replace such an experience! MJ it took me 2 days to read this report and WOW great trip and you and your family really earned my respect. I just want to add this pic of you and Peanut`s fall. Is that not the best photo of the trip with her reassuring you "That`s ok dad it happens sometimes but I am here, dad will be ok" Outstanding!! Dit wys jou die kinders hoef nie by die huis te bly nie! !